At minipack®-torre today we manufacture 3 different types of wrapping machines, designed to produce 3 different types of packaging: vacuum-packed, bundles or shrink-wrapped. What are the differences? Which sector does each one best caters for? Here is a summary of all our packing solutions and their applications. The machines that produce vacuum packaging are required in the catering and delicatessen sectors (small shops, supermarkets, fruit and vegetables, etc.) as well as in certain departments of large industrial companies. The MVS range consists of compact machines with chamber. They are optimised for sous-vide cooking and equipped with labelling systems and control display to quickly set up various production programs; the structure is in stainless steel: perfect for restaurants and the food industry. The SWING range includes fast and high performance machines, also from the point of view of energy saving, for large-scale vacuum packing. The traversing closure in fact allows the packing process to be sped up, while assuring high quality of the end product and excellent resistance over time. Shrink wrap film provides countless advantages in terms of product aesthetics, range of packable products, packaging resistance. For these reasons, shrink wrap packaging machines are required by small, medium as well as large companies: there is a suitable machine for each of them. Manual shrink wrappers with chamber are intended for small businesses: they are compact and take up little space, but still assure maximum productivity with minimum effort. Semi-automatic and automatic shrink wrappers with chamber are instead indicated for medium-sized businesses that wish to optimise packaging time, but still have full control over the production processes. In addition, they have a special focus on energy savings. The PRATIKA angular and continuous sealing shrink wrappers, lastly, (all fully automatic) are designed for industrial use. High packing rates, high capacity, a very high number of pieces packaged per hour (up to 3600 pcs/h) and the option of handling large products up to 700 mm x 360 mm make them the best automatic shrink wrapping machines. Automatic and semi-automatic bundling machines are the specific packaging machines to pack any product in multipack logic – water bottles, cans, jars etc. – or with highly resistant packaging. 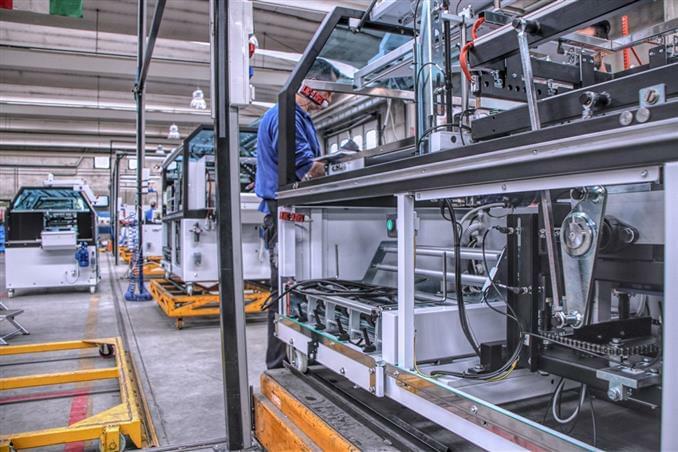 Do you wish to see all the features of our packaging machines in detail? Take a look at the specific section!